has excellent torque and speed curve. The stator of the EMF Motor® is almost similar to the conventional motor. Permanent magnets are glued to the inner side of the stator. The rotor is made of laminated steel and looks like a gearwheel. When the motor is supplied with zero voltage and frequency, magnetic ux which magnetizes the motor, is formed. When the frequency is increased, the rotating eld starts to turn. The two magnetic systems, permanent magnets and magnetization created by the rotating eld, start to pull and push each other over the whole circumference. 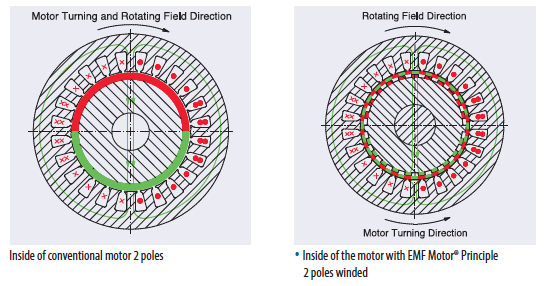 The rotor turning direction is opposite to the rotating field and the rotor turns much slower than the rotating eld. The permanent magnets and motor geometry dene the speed reduction ratio.